Palliative care is an approach that improves the quality of life of patients and their families facing the problem associated with life-threatening illness, through the prevention and relief of suffering by means of early identification and impeccable assessment and treatment of pain and other problems, physical, psychosocial and spiritual (World Health Organisation). 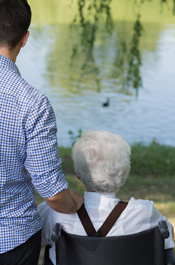 A palliative approach is not confined to the end stages of an illness; it provides a focus on providing comfort and actively reducing symptoms and distress and all health care providers can incorporate the palliative approach into their practice (Victorian Government Department of Human Services, 2009). Adoption of the palliative approach in residential aged care facilities in the Hume Region is supported by the Palliative Approach for Residential Aged Care Toolkit. The toolkit is a comprehensive step-by-step guide to implementing an evidence based palliative approach in residential aged care facilities (RACFs). It includes policies and procedures, education for staff, as well as resources for friends and relatives of residents in RACFs. The Hume Region Aged & Disability Link Resource Nurses provide support to RACF staff implementing the toolkit. The Hume Region Aged & Disability Link Resource Nurses also support staff working in Supported Disability Accommodation Services to care for people with life-limiting illness and at the end of life. The nurses focus on enhancing palliative care capacity within the service consistent with the Disability Residential Services Palliative Care Guide, Victorian Government Department of Human Services, 2009.